This fun beachy bow is made with a light blue satin ribbon with an overlay ribbon of darker blue with a sprinkle of cute tiny white dots. Flag back is a complimentary blue satin ribbon. 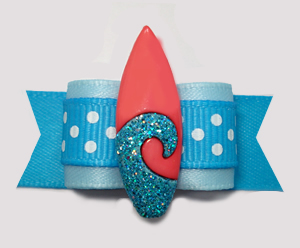 Best of all, securely stitched to the center of this unique bow is a surfboard, complete with sparkly waves. A fun bow!